Confession Number One- I am a shop-a-holic. It's true! I am always in a constant state of shopping, and no matter how hard I try, I can't seem to master the art of this whole "window shopping" thing. I think I might need a 12 Step Program. Confession Number Three - When I imaginary house shop, I always count the number of bedrooms, to make sure that there would be enough for my future closet, which, naturally, would be it's own room. Hey - a girl can dream, right? Confession Number Four- I color coordinate my closet. And I sort it by seasons. And by style. It's the one area of my life that I really attempt to be organized in. Confession Number Eight- I refuse to part with anything that still fits, might fit again in a few years, or could possibly come back into style eventually. I think most people call this being a pack-rat, but I call it thinking ahead. ;) I actually blame this habit on my mother, who never wanted to part with our baby clothes, growing up. Her justification is that, besides their sentimental value, some of the outfits were just too cute to part with, and that someday our own little ones might be able to wear some of that cuteness. Who can blame a mom for planning ahead? Hm? Not me. In fact, I decided to take after her. Why toss it out if it still fits? What if next month, I go looking for it? Better just keep that. Confession Number Nine - With this being said, I still have clothes from middle school. And yes, they still fit me. Confession Number Ten- I might have a few things from elementary school...that I wear...all the time...Like this sweater! Going through some of my old clothes a few months ago, I found this sweater that I had gotten when I was six. 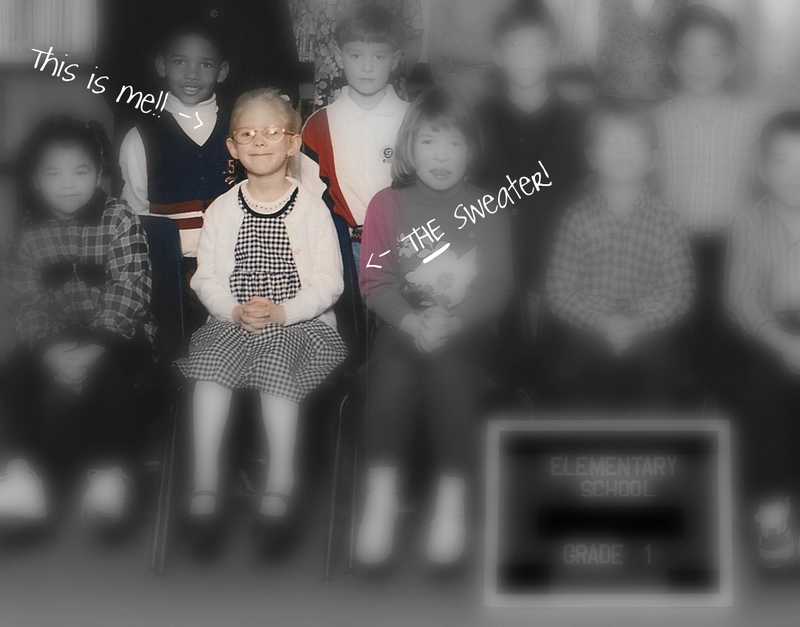 Sure, it made it's first debut during a first grade class picture. But why should that eliminate it from the running for most versatile piece for 2012? So, naturally, I added it back where it belonged (in my closet). All of my old clothes are hiding in my closet back home in California, but I do love to go in and find old treasures whenever I can. That sweater looks super cute even 14 years later. Nicely done! Also, my dream closet would probably be the size of my entire apartment right now, and it would come complete with a lounging area as well. High maintenance? I think not. if you're getting rid of clothes, send them my way, ha! i have some very random items from way back when hidden in my closet. off the top of my head, pink corduroy pants and purple track pants...i wouldn't dare wear htem in public, haha. You know that you have great basics when you can wear the same sweater 14 yrs later! Your also lucky that you are still small enough to fit into it! 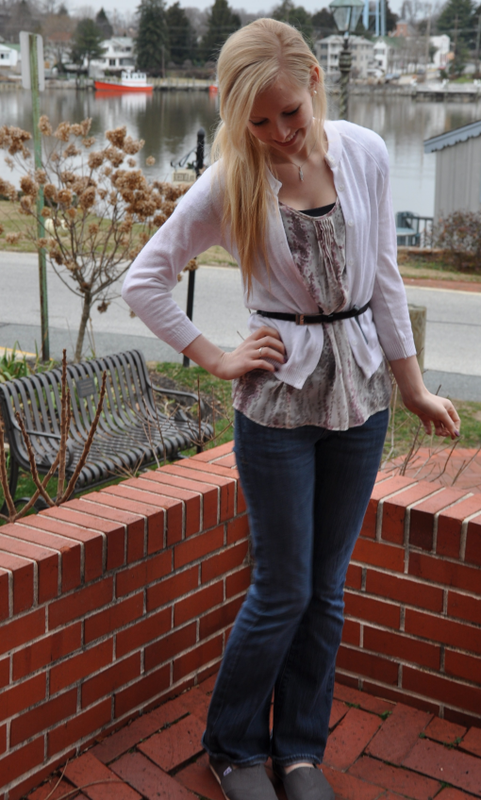 Love this outfit, and the belt! I have a walk in now, but when we move back to nyc, goodluck with that! Walk-in closets are the best! Next step would be a closet room. Yes please!!! I dream of having a closet like the one you posted...amazing! Thanks for stopping by my blog. Hope you will start following. Following yours now! Cheers! 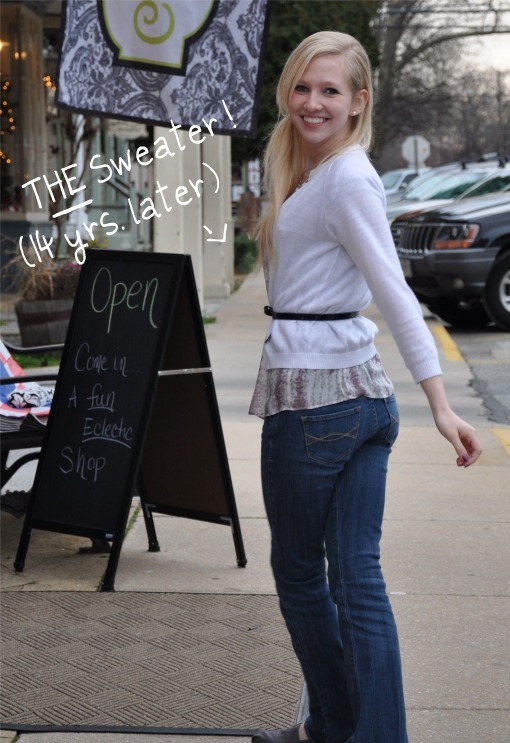 I am cracking up reading that you wear a sweater from middle school. That's amazing. I still have clothes from high school, but you take the cake! haha Hats off to ya! I just found your blog and thought I'd say hi. I'm totally cracking up about your sweater! I cannot believe it!! Hahaha that is amazing. Kudos. I have stuff in my closet from like 10 years ago, but nothing more. I try to get out the clutter because, to me, it feels like extra weight that I don't need. I actually love the idea of looking in my closet and loving every piece that's in there. Not there yet...still have some purging to do, but I'm getting closer!